Everyone knows that February 14th is St. Valentine’s Day. But did you know that February 17th is “Random Acts of Kindness Day”? Or that May 12th is “Limerick Day”? These are a few of the fun, surprising and little known holidays that Chandon has discovered, giving people reasons to celebrate life every day of the year. 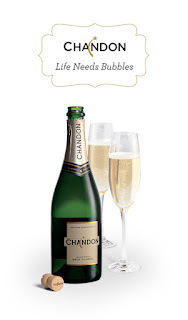 It’s all part of Chandon’s “Life Needs Bubbles” philosophy that embraces finding a reason to celebrate every day rather than waiting for the traditional holidays to hoist a glass. To help spread the word, Chandon has created the “365 Reasons to Celebrate” calendar that features a whimsical mix of traditional holidays (February 14th Valentine’s Day), little-known holidays (July 5th Introduction of the Bikini in France Day, June 22nd National Chocolate Éclair Day) and “this-day-in-history” milestones (July 20th First Man on the Moon, August 25th Mickey Mantle’s Birthday, November 23rd The Day The First Jukebox was Invented). If you'd like to download all 365 reasons to celebrate to your desktop calendar, please visit http://www.chandon.com/365/chandon-365.ics to plan your social calendar with panache. Life Needs Bubbles and an open bottle of Chandon has the power to transform an everyday moment into a special occasion. And whether it’s in honor of The Birthday of Happy Hour on November 12th or National Sangria Day on December 20th, you’ll find every day of the year offers a reason to celebrate. Founded in 1973, Domaine Chandon was the first American sparkling wine venture established by a French Champagne house (Moët & Chandon). Chandon crafts a range of sparkling wines that reflect California’s vibrant regional character yet remain true to the practices of méthode traditionnelle. A leader in viticulture as well as winemaking, Domaine Chandon is at the forefront of sustainable farming practices and continues to replenish, control, and in many cases restore the natural habitat. Domaine Chandon’s acclaimed fine dining restaurant étoile received a star rating in the 2010 Michelin Guide.